Given proper care and growing conditions coconut palms produce their first fruit in six to ten years; it takes 15-20 years to reach peak production. What about a coconut palm variety which flowers between 24 to 30 months? The answer: Ramganga hybrid variety. Umpathy Farms of Tirupur, Tamil Nadu with assistance of OVR Somasundaram, an expert in the coconut field has combined Gangabandam and West Coast tall into a D*T hybrid, called Ramganga. 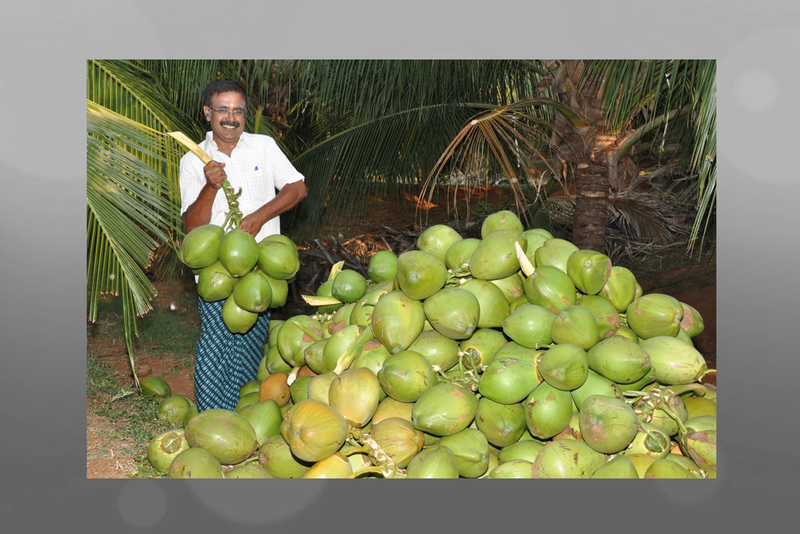 According to Umapathy Farms the Ramganga hybrid variety is the perfect solution for farmers aspiring to develop a farm in which their coconut trees should deliver high nuts per palm, sweet tender coconuts, high quality copra, and high-yields of coconut oil. •First flowering starts anywhere between 24-30 months of planting. •When harvested for tender coconuts, it produces 300-350 nuts per year. •Instances of reported of more than 400 nuts per year. •If not for tender coconut, it can yield up to 250-300 nuts per year per tree. •Tender coconut contains 500 -750ml of coconut water. •Copra content is around 16 -18 kgs for 100 nuts. •The sweetest coconut water in any hybrid variety available in India. •The growth of Ramganga is considerably low compared to that of other hybrid varieties. This makes it easy for harvest, which is the biggest headache for farmers today! •The branches are so dense that the farmers have to spend less time in bunch tying. There is money in dates; I’m referring to the fruit. Arabian date palms can be the right choice for our agriculturists growing crops in water scarce areas as they are capable of withstanding harsh climatic conditions and erratic rainfall. Date Palms can be grown with minimum maintenance, low expenditure and with nil chemical fertilizer expenses. They do not get attacked by pests and diseases. Animals do not browse these trees. According to leading date palm cultivator S. Nizamudeen of Saliah Dates Nursery in Dharmapuri dist the date palm trees are gifts to agriculturists in drought hit areas. Considering the minimum input, the profits are enormous. Profits continue for 100 years at a stretch. Employed in a seed processing farm in Saudi Arabia earlier, Nizamudeen had come across several date palm trees with rich yield. Having returned with a pack of good quality seeds of varieties like Aguah, Makthumii, Sukkary, Kalima and Muscat to his native Krishnapuram village in Dharmapuri district he produced seedlings, under the technical guidance of one Nassar, an agricultural graduate. He planted seedlings and now the tree are around 14 years old and gives an average yield of 150 kgs of dates per tree per year fetching about Rs 50 per kg. 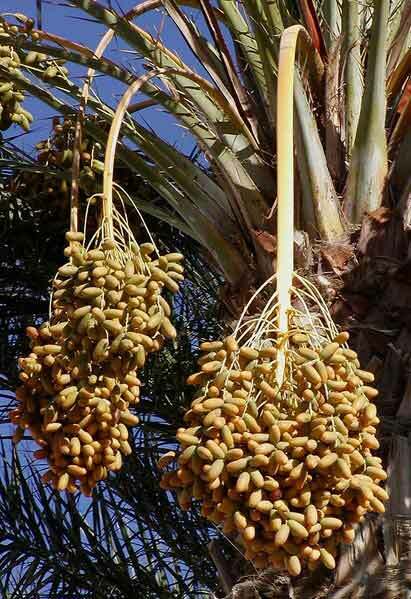 According to Nassar the cost of cultivation for date palm is Rs 11000 to Rs 15000 per acre having a population of 112 – 150 trees with a return of about Rs 1 – 2 lakhs from sixth year onwards, though it starts yielding from fifth year onwards with an average yield of 40 kgs per tree. Saliah Dates Nursery has seedlings namely of Agwah, Sukkary, Makthumii and Muscat. Variety of Suckers include Halawi, Kadhrawi, Zahidhi, Sayer, Khals, Mejnaz, Ruzuz and Zhugolul. Tissue culture plants of date palm available are Bahri and Red Plant. Vibhu Natrajan exports palm trees to the Middle East from his farm in Chennai. Natrajan recalls that two years ago an ornamental plant with thick long leaves called ‘mother-in-law’ was fetching upto Rs 40k per plant in Southeast Asia. Among the popular palm tress that grows at Natrajan’s farm are Dypsis decaryi, an unusual palm from Madagascar with a triangular trunk; Syagrus schizophylla, a Brazilian variety, and Wodyetia bifurcate, an Australian variety commonly called the foxtail palm, which is popular because it grows easily and quickly. 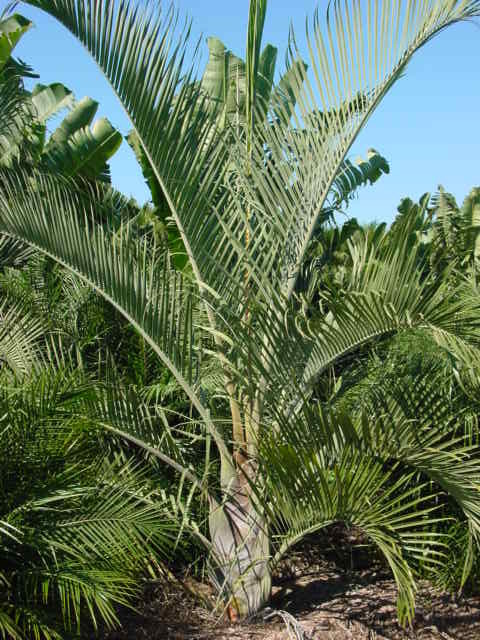 Bismarckia nobilis is a handsome palm with silver-colored leaves from Madagascar, which can grow well in tough conditions. Phoenix rupicola is a beautiful soft-leaf palm from the lower Himalayas reaches, and North India’s khajur or Phoenix sylvestris—silver date palm—is the most popular landscape palm because of its low maintenance and ruggedness. Among the avenue trees, the Brachychiton acreifolius , or the Illawarra flame tree, with its bright crimson flowers, is the most sought after. The Brachychiton rupestris—Kurrajong tree or bottle tree—is an Australian showstopper. It is easy to transplant and can survive up to three months after being uprooted. Pluemria—frangipani or pagoda tree—is popular among women.